As Spotify cuts its free hours, where's best for legal tunes? What's green and looking a bit shaky? No, not Kermit on a booze binge. We mean Spotify's free service. From 1 May free users can only listen to 10 hours of music, and individual tracks can only be heard five times apiece. So where do you go if you can't or won't pay for Spotify Unlimited or Premium? Here are 9 free Spotify alternatives worth a listen. Mflow is an interesting proposition: five million songs, no ads, and an integrated social network for easy discovery of new music. The sound quality is superb, the catalogue covers everything from Katy B to Bob Dylan and the whole thing is really rather wonderful. It's Twitter for tunes. Grooveshark is probably the closest equivalent to Spotify, but unlike its rival it's completely web-based: there's no software to download. It also takes a different approach to adverts, with visual rather than audio ads. You can search for music or listen to pre-defined radio stations and playlists can be shared, and the quality is generally good. We say "generally" because the odd track is shockingly poor. That's because Grooveshark was originally designed as a file sharing service, so you're listening to other people's uploads (you can upload your own collection too, but you can't download anything) - and that means the selection will include awful rips and poor tagging. Ever wondered what Muse's Supermassive Black Hole would sound like if the band performed it in a bucket? Now you can find out! Last.fm is more about music discovery than listening to what you already know: its famous "scrobbling" analyses the songs you listen to (not just on the site, but in desktop and mobile music apps too) and comes up with suggestions for similar music it thinks you'll like. Frustratingly many of the available tracks are just previews, and the free radio streaming is a paid-for service in some countries (but not the UK). French streaming music site Deezer could be brilliant, but isn't: despite deals with major record labels and music from the likes of Ellie Goulding and Rihanna, it's as likely to play horrible French rap music as it is the song you've actually selected. Its Smart Radio promises to learn what you like and tailor playlists accordingly, but its Dumbass Website frequently offers music the site doesn't actually have. Merde! 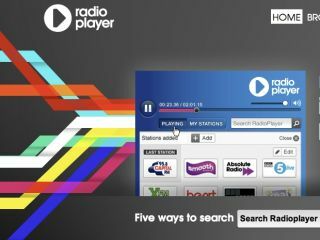 A partnership between the BBC, Global Radio, The Guardian Media Group, Absolute Radio and RadioCentre, Radioplayer is a one-stop portal for all the UK digital radio stations you can think of, and a few you've probably never heard of. Think iPlayer for BBC and commercial radio and you've got the idea. We're reliably informed that The Kids see YouTube the way previous generations saw radio, so it's nice to see Google making music discovery easier with its Disco service. Simply enter the name of an artist or click on Top 50 for, you've guessed it, the Top 50. Warning: YouTube Disco may contain Justin Bieber. MySpace isn't one of the cool kids any more, but it's still an excellent place to listen to major artists' music. The My Music service enables you to create your own playlists, but it's a bit patchy: for example when we searched for Foo Fighters we couldn't add anything from the current album, even though we were listening to it in another open MySpace tab. Musicovery's lo-fi free service does a decent job of finding music that's similar to the artists you already like - but unless you stump up 3€ per month for the premium version you can't limit playlists to your favourites and ban songs you can't stand, and the sound quality's hopeless. Soundcloud is the indie musician's friend, a site designed to make uploading and sharing original music as simple as possible. It's spawned a range of apps - mobile, desktop and web - and there's a decent range of known names as well as up and coming artists. Desktop apps such as the Soundcloud app from the Mac App Store are easy enough to use, but the process of finding and adding tracks happens in the browser and it's pretty laborious. If you're willing to spend the time there's lots of great stuff here, but if you're looking for something in a hurry this probably isn't the service for you.